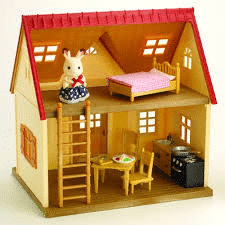 This cute Sylvanian Families Cosy Cottage Starter Home is not too big and not too small. It’s just right for starting off a Sylvanian Family collection, and it comes filled with a Chocolate Rabbit sister and loads of furniture. Just perfect for playing house-house. It can be a single story or a double-storey because the top floor can come out and convert to a paved patio area or a lawn. 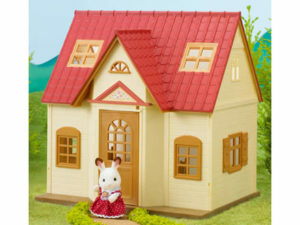 All Sylvanian Family buildings are connectible. See how this Cosy Cottage fits onto the City House with lights (the cottage could be where Granny and Grandpa live) by watching this video here or scroll down to the bottom of this blog. You can add collectible items from the extensive Sylvanian Family range. 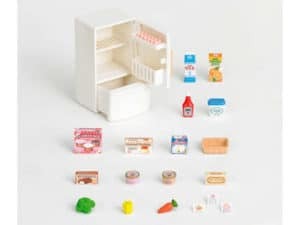 The life-like fridge in this picture comes with tiny groceries that fit inside. Some of the groceries need to be made up such as folding the pre-printed cartons for butter, orange juice and ice cream, and placing stickers on the yoghurt and ketchup, for example. Occupational therapists love activities such as these that require the use of fine motor control using them muscles of the fingers and the eyes. Playing with Sylvanian Families together, gives parents the opportunity to engage with their child’s imagination and to ‘hear’ what they are thinking by observing their play patterns. Are they illustrating nurturing and kindness? What makes them do happy play or sad play? One of the key benefits of doll and doll house play is that children get to play their emotions out, making sense of them in appropriate childlike ways and getting their feelings in order. It’s one of the reasons why play therapists, child and educational psychologists encourage play with Sylvanian Families. I really do wish more children were encouraged to play with real toys like these instead of spending hours on a screen. As Sylvanian Families is an heirloom product, you are investing in quality that will last beyond your child’s lifetime. This means they must learn to look after their special possessions. In an instant gratification, throw-away society today, this is an important thing to learn. Collectors of Sylvanian Families must make sure they have some plastic storage boxes or shoe boxes handy to keep all the little items safe! Remember that Sylvanian Family members look after each other. They are kind, loving and nurturing. Keep your child’s imagination alive by investing in Sylvanian Families that provide the ultimate in both collectibles and connectables. Sylvanian Families was reviewed by Nikki Bush for Toy Talk.